Exactly a month ago, I received hair care products for review that contain Argan Oil. It is a plant oil produced from the kernels of the argan tree, endemic to Morocco, that is valued for its nutritive, cosmetic and numerous medicinal properties. It is also known in cosmetic use as moroccan oil. 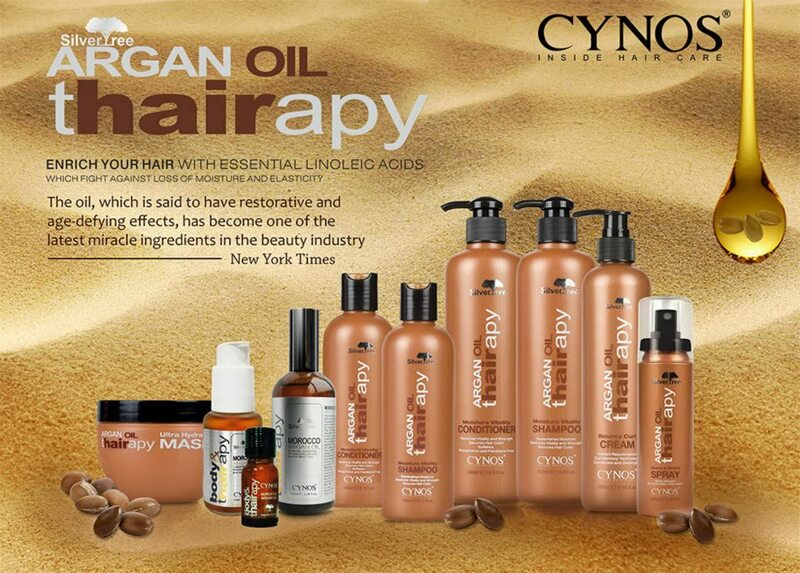 I was very fortunate to be able to try Cynos Argan Oil Thairapy, because argan oil worked wonders in my dry skin and hair. I think that's what I really don't like about my physical features - my being dry; that's why I love lotion so much. When I got to try the shampoo, I was not expecting that it'll do magic to my hair instantly. It also smells really, really good. Amoy-mayaman, hehe. And then I followed it up with the conditioner, which smells super fragrant! The instructions say that you have to towel off the wetness from your hair first before you apply it. I did. When my hair dried on day 1, it kinda felt heavy. I repeated the routine on day 2 and used a hair dryer. I blow-dried it until it was just damp, then air-dried it upon going out. It felt so much better. My unruly hair was prim and proper for a day! 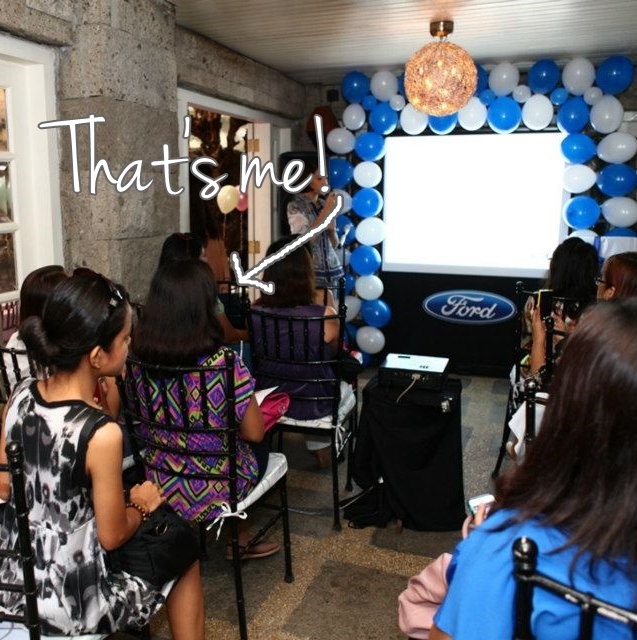 Too bad I didn't get to have pictures. I think that's the secret in using the products, you have to put a bit effort to style your hair so you could get the best results. My super favorite now is the Morocco Argan Oil, which I apply on my feet cracks every night. I hate those, but Morocco Argan Oil slowly takes it away from its drought. And like its shampoo and conditioner variant, it's fragrant, too. Sometimes, I get a pea-sized amount and apply it on the ends of my hair to prevent breakage. For more information and updates about their products, please visit their Facebook page --- CLICK HERE. 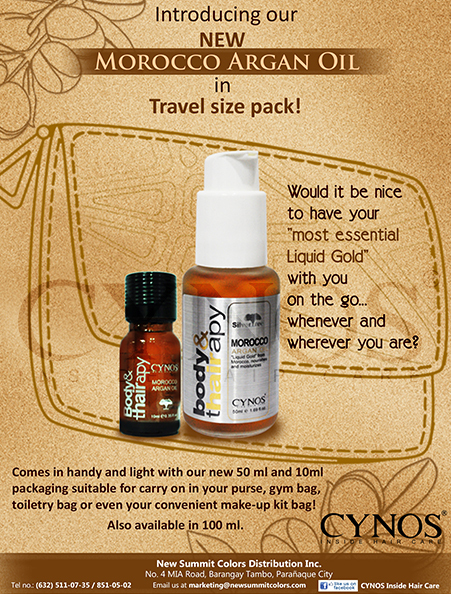 I received products from Cynos for review but all opinions and thoughts are my own. thank you for the recommendation, I love argan oil but I use it in other brand, it's pro naturals moroccan argan oil which is great and keeps the hair soft, shiny and healthy.